Most of us are well versed in the benefits of yoga – but did you know yoga for sleep in particular is seriously effective? Below Lisa Sanfilippo, London’s leading yoga for sleep expert, reveals seven tips to help improve your quality of sleep and deal with insomnia. At least three times a day, or more, take a break and focus on conscious breathing.During the day: Breathe into the back of your middle ribcage – around the bra-line – to feel more energised. This bigger breath makes you feel more awake and alert. To create a balanced steady feeling, take an inhalation and exhalation of the same length, without straining to do so.Before bed: Take a Buddha belly breath – which is the opposite of a ‘bikini belly breath’. As you inhale, relax your low belly and allow it to puff out gently between the pubic bone and your navel. As you breathe in into the deep low belly, this stretches the area and a gently lengthened exhale here creates a very settled and relaxed feeling. Making the exhalation longer than the exhale, say a count of four to the inhale of a count of three, or extending to a count of six on exhale for a count of three inhale really taps into the rest-and-digest function of your nervous system. We all have a natural dip mid-afternoon; this is when you’re probably hitting coffee, sweets or the gym. Instead, let your nervous system power down with a brief bit of meditation or a restorative yoga posture. You’ll draw upon less reserve energy for the rest of the day and be less frazzled and wired when sleep time comes – better primed for a restful night. a. Practice child’s pose over a cushion. From an all-fours position, bring your big toes together and keep your knees wide. Stretch your hips back and rest your belly and head on a bolster, or a cushion from the arm of a sofa can work brilliantly. If no pillows are to be found just rest your head on the floor! b. A great meditation technique is to focus on the breath as it enters and leaves your nostrils – noticing the temperature, texture and moisture in the air, without trying to control your breath. When your mind wanders, be gentle with yourself and guide it back to this small area. Your focus narrows to this small space and your mind calms easily and gracefully. It’s like pressing a mental ‘reset’ button. Sun salutes stretch the major muscle groups of the body well and get your breath moving freely – making you feel more alert. 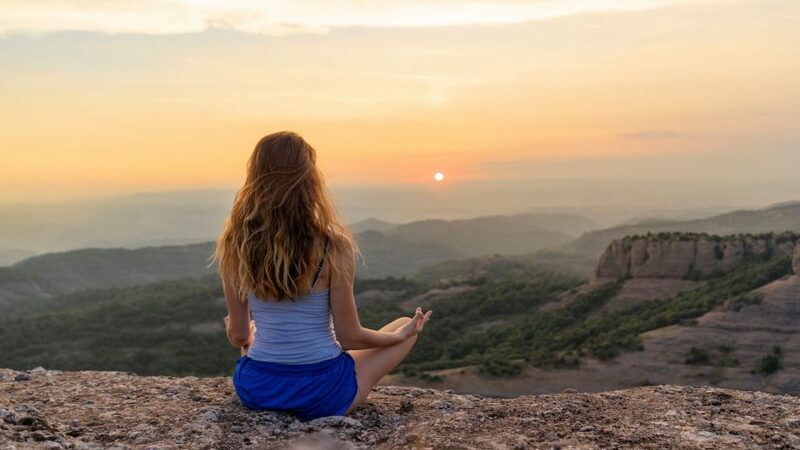 With this bite-sized bit of light and uplifting exercise in the morning, you’ll start the day having synchronised your movements with your breath, clearing your mind, boosting your mental focus and sense of physical wellbeing. You’ll no longer start the day stressed and behind time and instead be bright-eyed and ready to greet the day. Shut your eyes and focus on releasing the places where tension accrues in your body. Do this several times a day. With eyes closed, mentally scan your body and feel any place that you hold tension. Imagine that you’re breathing light into this area as you inhale, and the area that’s tense dims and softens as you exhale. That way when it’s sleep time, there will be less accumulated tension to slough off before being ready to drop into sleep. Book a meeting room at work and get your legs up the wall. Breathe and let your body get heavy into the floor for ten minutes. You’ll start taking conscious even deep breaths inhaling and exhaling for a count of four, but after about 10 breaths let your breath be natural; it will become shallower as you relax. It takes at least three minutes of being settled for the ‘relaxation response’ to kick in, and 10 minutes usually creates a feeling of relaxation and readiness for the rest of the day. 1. Slip into mood lighting: Your body is naturally programmed to produce melatonin, the brain chemical that induces sleep, when it gets dark outside. Bright lights late at night, like at the gym or a well-lit living room can keep you awake. Start turning down the lights two hours before bed, and switch to low, warm light- candlelight is very soothing. The organic red light of a candle, instead of the blue-tinged light of your phone or tablet, will calm the tired mind and send the sleep message. 2. Treat your feet: Take your shoes off several times a day, to create a grounded and relaxing sensation. Wash your feet at night before bed, whether in the shower or just popping a foot up into the sink. After warming the feet up, it’s prime time for a little self-foot massage or some reflexology points with soothing raw sesame oil. Add a hint of vetiver or rose essential oil to sink further into a relaxed state. 3. Rest your head: Pressing the acupressure point at the ‘third eye’ just between the eyebrows and gently pulling downward towards your nose will calm the muscles of the forehead, sending a ‘calm down’ message to the brain. This is the opposite of raising your eyebrows (which is stimulating and activating to the nervous system). Combine this with slow lengthened exhalations and you will feel the difference immediately, and your face will emerge looking calmer and more easeful. Reel out a calming sequence of yoga poses that begins with some hip rolls on all fours, continue by stretching your hamstrings then move on to release tension in your hips, breathing into the low belly and feeling your body drop on to the floor as you breathe out. Take this inversion pose that places gentle pressure at the crown of your head or at the third eye point – the place we can scrunch up the forehead when we’re stressed. Take a wide stance, with your feet as wide apart as your arms when you stretch them out to the sides. Now bow forward at the waist – you can put your bottom against the wall if you need support. Put your hands on the floor and bending forward press your forehead, or crown of the head, to the seat of a chair or if you’re bendy and have a yoga block press the head gently to the block on the floor. This calms your brain instantly. A gentle forward bend with your legs astride chair legs and head on the chair will stretch the long muscles along the spine and take the tension out of having to hold your body up all day long. Taking time to care for yourself all day is the key to relaxing better at night and dropping off into a state of sweet slumber. Consider your crash course in yoga for sleep, complete.